Hey fellas. I know I like to disappear for days/weeks/months on end. It's due to a mix of random life and a bit of aimless wandering. 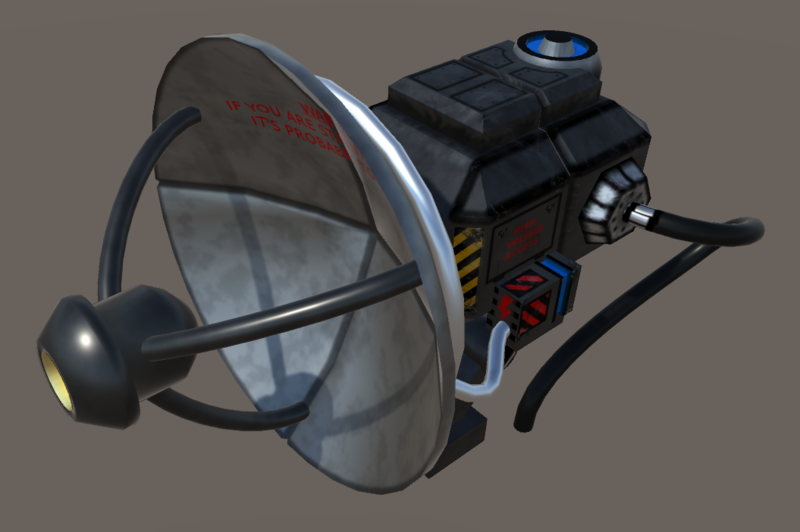 I don't really have too much new to offer, but thought I'd throw up a pic of the most recent 3D Outpost related thing I've been tinkering on. I was working on OP1 buildings, but have been getting bogged down in the size and details so thought I would try to whip up something a bit more simplistic. I think I'm partially posting this in hopes to encourage myself to continue making more. I haven't messed with the spectacularity yet, so it's all a bit shiny. I've mostly been messing with the texture the last couple days. Hopefully more to follow, but no promises. Feedback on this one, and thoughts for next model (either rail gun turret or lynx body)? Wow, that actually looks pretty good. Heh, "High Voltage Access". I have to ask, what does it say on the front of the dish? Definitely go with the Lynx chassis next. Thanks! That really means a lot. Really! Gotta access them high volts somewhere. Don't ask where the Low Voltage is hidden...The front of the dish says "Warning: If you are staring at this, it's probably too late." That was the most clever thing I could think of at the time. Sounds like a resounding vote for the Lynx. Any other takers? I might start working on that tonight. If you guys have other good source pictures, please feel free to post them. I also found some good third party artist renditions that are nice fillers. The original graphics leave a little to be desired. Perhaps I need to go through the old videos again. Do the files you work with store any kind of animation information? The "low voltage" was a bit of a joke. But no, that turret does not have any animated parts on it. That model was more for practice, so it's not really set to do anything in particular. 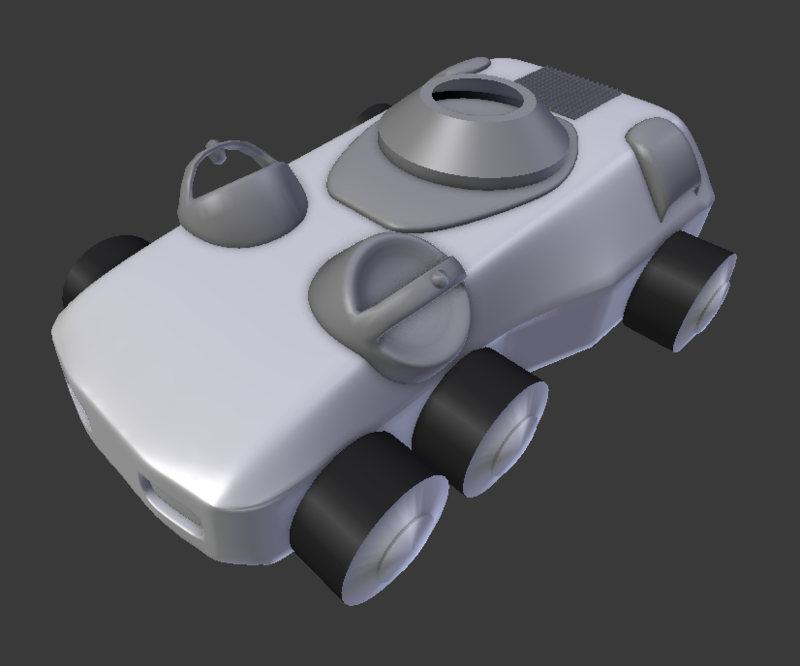 I wouldn't use this one for any sort of game since it has a rather high poly count, but I was looking to fiddle with the texture on a semi-complex model (working out some new texturing techniques). Blender (which I'm using) is capable of animating models though, or they can be worked directly within Unity (which I also use) depending on the desired setup. Additionally, after watching the in-game videos, the picture above seems to be a pretty faithful representation of a Lynx. Though I was a bit surprised because I wouldn't have guessed some of the details from the (admittedly un-detailed) in-game unit graphics. Thanks dave! No worries, I'm still learning too (and have a long way to go). Perhaps we can work together at some point. Here is some progress on the Lynx model. This is a couple days work on a third iteration (I was rather unhappy with the first two iterations). I'm still not excited about the body itself, but I moved on to some of the other details in hopes that the body proportions would start to look a little better. Also, the wheels are in for scale at the moment. I'm not sure I like the hubs in the source artwork, so I might change those if I can't get the source models to feel a bit more in-style. The wheels do look a bit funny now that you mention them. Looks like there's no spacing, like they would rub against the body. Are you following any specific tutorials, or taking any courses to learn how to do this? No specific tutorials for these projects. I have watched tutorials, but I'm not using anything specific (like a car or "futuristic weapons" tutorial) for these projects. I haven't taken any courses either and it's all been self taught, though I haven't been too serious about Blender until more recently. My avatar is actually a render I made waaaaay back with POVRay. Yes, that's definitely part of it, and there's no detail in the hubs either. They also just sort of feel out of place. The wheels aren't really protected in any way, so they can be hit from pretty much any angle around the vehicle. They're also slick, and don't seem quite rugged enough for fast-paced operations on a hostile, rocky planet. I'm not sure yet...Right now, it's just feeling like I'm modeling a NASCAR rather than a weapon of war. Here are some wheel tread prototypes I'm building out to see what might look good. 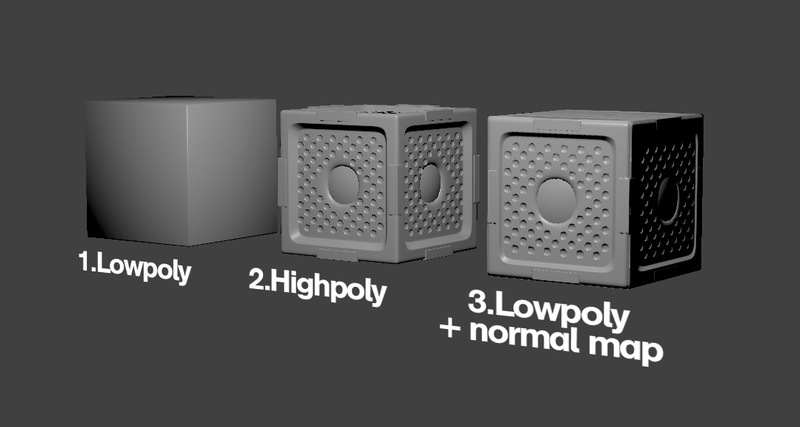 Generally speaking, the poly count increases from left to right and complexity from bottom to top. I'm not sure which I like best yet, but the top left one is looking favorable at the moment. It looks rugged, but also a bit futuristic. I was thinking more tutorials that got you comfortable with the tools, rather than ones you were specifically following for this work. I assume once you're comfortable with the tools, you can more or less figure out anything you can imagine. Those are some pretty cool looking tires. It seems you're taking this tire problem quite seriously. I'm impressed. Definitely not the middle right tire. Looks like the weight of the vehicle would be concentrated too much on the outer ridges. Makes me think they're about to pop. The bottom right tire also looks similar, but to a lesser extent. They both look a bit too slick actually. Sort of the same with the bottom left tire looking too slick. It seems too simple, too flat. There's no angle to the treads. Maybe kind of boring. All of the others I like. They're fun to look at even without a vehicle body. Though I suppose once you include it with the vehicle body, poly counts start becoming more important than details on the tires? I really have no sense for what is a good target poly count, or how much it affects performance versus detail, or if there is a way to handle both depending on context. Sure, I understand. And yes, I've watched/followed/practiced quite a few tutorials (many types). If you are interested in doing some, I can dig up a few. I didn't want to dive into "yay blender!" if that's not what you were asking. The tires were fun to make, though my biggest problem is always with my imagination. I do okay taking other things I see and copying/modifying, but I have a hard time coming up with things out of thin air. I would agree on your assessments of the tires. The ones on the far right feel too much in the "race car tire" category, and the vehicle itself already feels too much like a race car. Poly count targets are really dependent on what you're trying to accomplish. If this Lynx was a one-off vehicle in a game, say like a jeep in a first person shooter, then you can get away with (and would probably want to use) a higher poly count. If it was for a vehicle in an RTS game, then the poly count needs to come way down because there would be dozens of these things moving around. That being said, I'm mostly aiming at just modeling at the moment (and using the OP universe as the subject), so I'm less concerned about poly count. What's interesting is if we take the middle row as an example...the left most tire is about 830 triangles while the middle two tires are about 1600 triangles. At face value, if we're only concerned about triangle count, it seems like the left most tire is the way to go. But because the left tire has large features, the middle tires are actually easier to reduce face count with some visual and shader trickery in-game. Here's the same 1600 triangle model on the right, with a 280 triangle "lower poly" version on the left. You can see some artifacts when making the lower poly model, and they become especially noticable when up close. But from a distance, the reduced geometry isn't as obvious (and there are other tricks that can be used to hide the artifacts). I'm certain more could be done to make it look better, but just a bit of an example. The "big features" model would result in more distortion when trying to map onto a lower poly model. But the "big features" version might be more desirable if the model was going to be a single (or few) vehicles for something like an FPS, since you would get closer to it and the extra geometry is needed to give a better feeling of depth. And really, both of these models are probably overkill if the wheels are only going to be viewed from far away because the details are relatively small. So it just kind of depends on what you need, and what you're aiming for. I've watched/followed/practiced quite a few tutorials (many types). If you are interested in doing some, I can dig up a few. I didn't want to dive into "yay blender!" if that's not what you were asking. Actually, that is kind of what I'm asking. I just know there are people who will read the forums, and would like to know how to learn this sort of thing, but won't ask. I'm a bit curious myself, and would like to branch out my skills a bit, though I don't imagine I would go too heavy into blender. Maybe just enough to understand what other people are doing. I think it'd be a good idea to start a thread with resources to learn 3D modelling. We could use more skills like that around here. There have already been a number of remake/sequel attempts that used 3D graphics, so why not have resources on that sort of thing. Doubly so since 3D modelling is hard and very time consuming. I've always thought it was a daunting task to produce enough resources for an entire game. This is something we should train more people on. Interesting comment about FPS versus RTS poly counts. Indeed, an RTS will have more duplication. I was thinking of cut scenes versus game play. Cut scenes might contain closeups of units, and could require higher definition models. Is it easy to reduce the poly count of a higher resolution model? Is there a way to do it automatically? If so, are the results reasonable? I would hope there is a way to do it without either having to manually build the model at both resolutions, and doing a lot of manual tweaks to reduce the poly count. Your tire example does show some noticeable artifacts. Do you know what causes that? It looks almost like there are seams that don't quite match up. It also looks like the treads are not as deep on the left. I wouldn't have expected such a change in geometry. You mention feature size and shader trickery. Is that something you can go into a bit more? How does this help reduce poly count, and how much can it help reduce poly count? Are you saying you can reduce the poly count of the middle tires below what is possible for the left tire? Okay. If people are really interested, I can maybe find some good starter tutorials. What I've found with Blender is that there are a TON of tutorials out there...but even the "beginner" ones don't always do a great job of explaining things (end up being more of a "paint by numbers" sort of thing). There are definitely some that are really good to start off with, but initially learning Blender can be an exercise in patience. Also, I make no pretense of being some sort of 3D modeling expert myself. There are lots of approaches, and lately I've been trying new things to see if something else might work better for me. 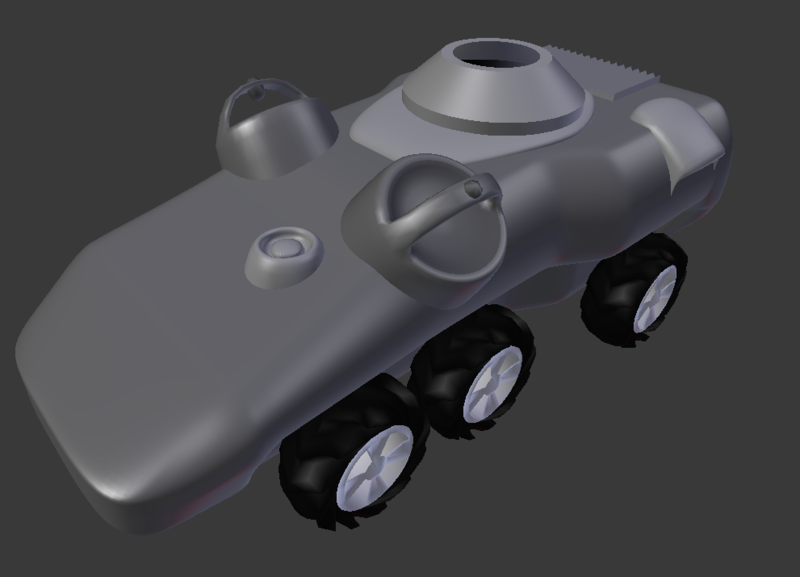 Most of the stuff I've modeled has been on the simpler end of things, and I've largely ignored texturing. That's part of why I picked the laser turret to model above. 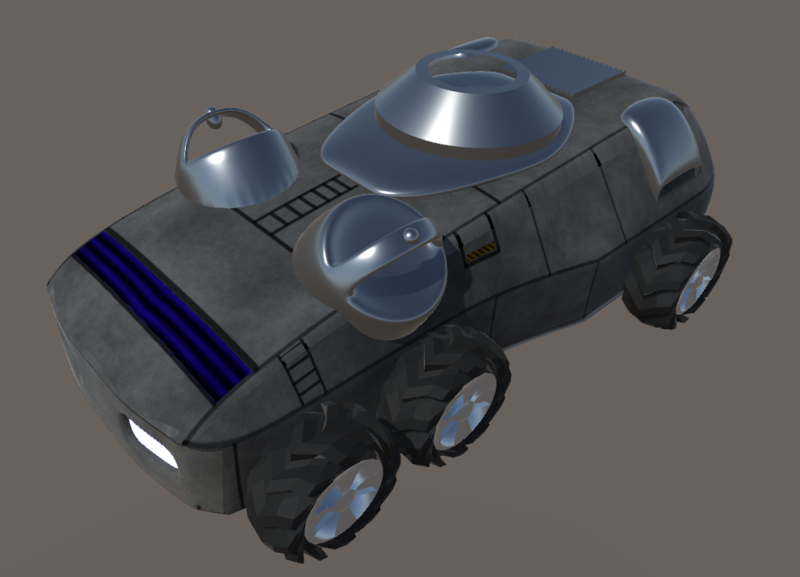 Mostly to practice texturing something technical (that texture was all hand built, and not "modeled"). As far as high vs. low poly models...There are some tools that can help do the task automatically. However, the computer doesn't always know what's artistically better, or what works best with the model's skin. Texturing can also be used to hide low geometry, because the texture itself can be used to hide seams or visually modify how the geometry looks while the video card is rendering the triangles. 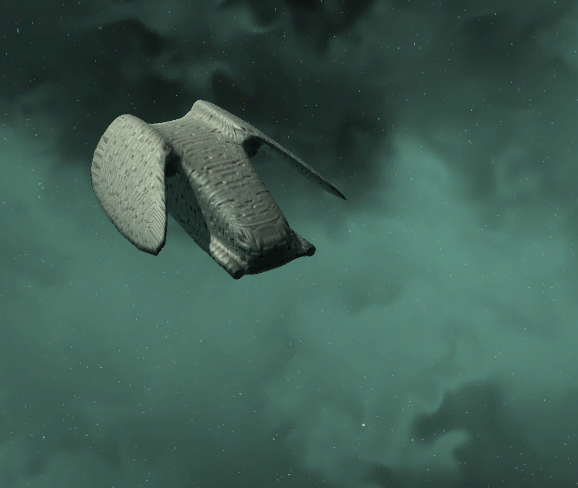 Another example of poly count...Here are two pictures of another ship I modeled previously (though I never got around to building a skin). The left one is a first one is a high poly model up close, and it contains about 33,000 triangles. That's probably a bit overkill for the main body, but it needed enough polygons to be smooth around the edges of the "wings." So looking at the model, I can tell that it probably needs a little more geometry at the wing tips, but otherwise is okay to look at from this distance. I would say that it's likely that some more polygons can be removed from the front and underside of the cockpit (relatively flat areas), as well as the middle "flat" part of the wings. That being said, if I were to zoom out much further from the model in the picture, the corners on the wings will already start to melt away. That would be a case where some reduction in poly count can be done automatically (or simply due to how the model is constructed with Blender's options), but there are places where manual modifications are needed. I explain a little above, but for the most part there's a blend of auto and manual work that (likely) needs doing. It probably boils down to how much work you want to put in (or time available). You don't have to "completely build" each level of model, but more sort of build the low poly models "on top" of the high poly ones. Then you can use high poly geometry to help generate textures needed to improve the visual quality of the low poly models (a technique called "baking"). A lot of the artifacts in this example is because it's a round object, and is using textures to sort of "stand-in" for the missing geometry. The geometry isn't actually there, but the game is attempting to shade the object with texture data. Since the real geometry is missing, actual shadows are not being properly cast by the game engine (because there isn't an object there to cast a shadow). This technique would be even worse for something like the big-feature tires, because the feature size changes so much, the flat texture tricks can only compensate for so much. I can probably explain some, but depends on how familiar you are with modeling, graphics cards, etc. already. It can be a long explanation depending on how deep down the rabbit hole you want to go. If you're familiar with bump mapping, that's probably the most popular way to give detail to a flat model. Modern graphics cards are able to sort of simulate subtle geometry during render time by use of maps which distort the light reflections (normal maps), or actually make the pixel shift a bit (height maps). This can give the illusion of angled surfaces or depth, without having to have those details modeled in actual geometry. 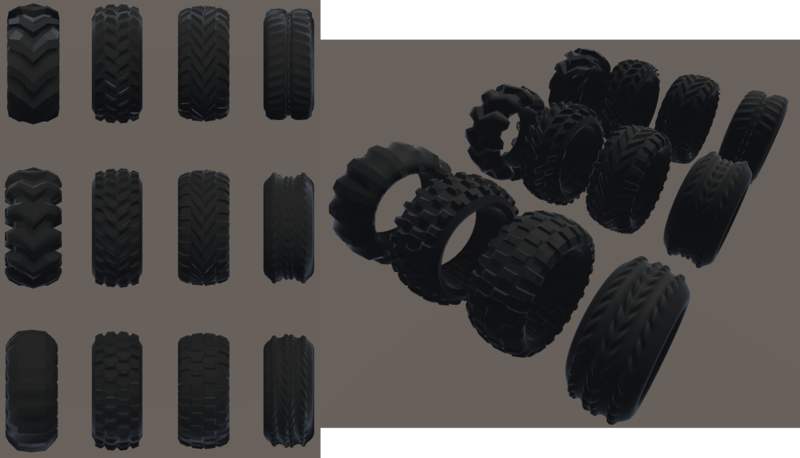 So yeah, the tires in the middle would likely be easier to reduce the poly count than the ones on the left, because the geometry changes are smaller (more subtle). Starter tutorials would be excellent. Especially if you've picked out a select few good ones. Curated content has enormous value when there is a sea of low quality stuff to sort through. You don't need to be an expert in something to help other people. Just being one level ahead is usually good enough. From what I've seen already, you clearly know enough to help other people get going with this sort of thing. I'm curious what you mean about the texture being hand built, and not modelled. I know very little about the process of texturing. 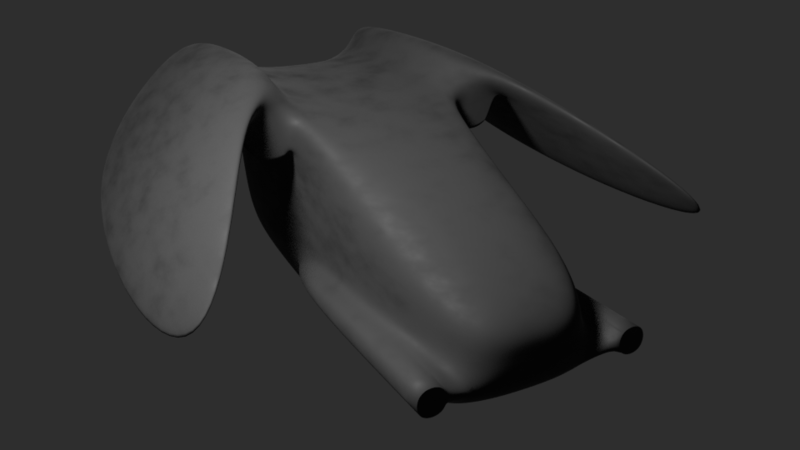 You also mention tools that can help lower poly counts, but might not know what works best with the model's skin. This might be a good topic to explore in the future. It's not clear what features of the model or of the skin affect quality. In particular, why do seams appear, and how would a texture help? I see what you mean by the sharp corners at the wing tip. 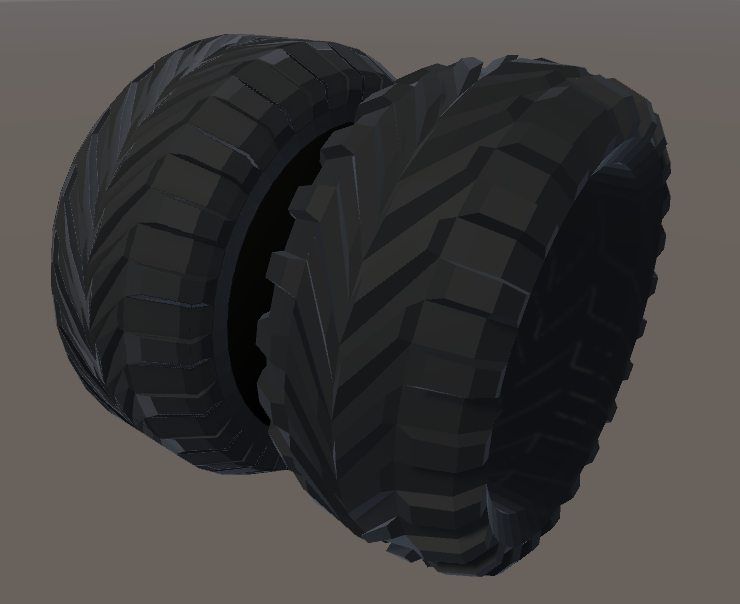 Could a bump mapped texture be used for the tire treads? If so, would it be noticeably different up close? Is it possible to use different resolution bump mapped textures depending on distance to the object? That bit about "baking" sounds like a good future topic. Is that something like using the differences in geometry between a high poly count model and a low poly count model to produce a bump mapped texture to compensate? Is there much of a computational cost to bump mapped textures? Why are they used? Perhaps your note about shadows gets into this. As does the note about light reflections. Don't worry if you don't have all the answers yet. These are just things I'm wondering about as I read. Clearly there is a wealth of knowledge behind it all. I built the laser turret textures by opening up a paitn program and making a texture. There are a few ways to make textures, and Blender has the capability to do texture creation as well. For seams, which kind do you mean? There are seams related to the geometry of the model and due to how the texture is mapped to the model. Yes, a bump map can be used to give the illusion of treads. Bump maps are good for subtle features, such as a the indent around an access panel, dimples on an object, or some roughness on a surface. But it doesn't do a great job of fully replacing geometry. If things stick out a lot, a bump map doesn't do a great job compensating for that. A bump map only adjusts the lighting reflection so it can look like the surface has variation, but doesn't actually change the surface or give it real depth. Baking is the process of creating a texture from some compilation of other details. That's sort of vague, but it's a bit of a general term. 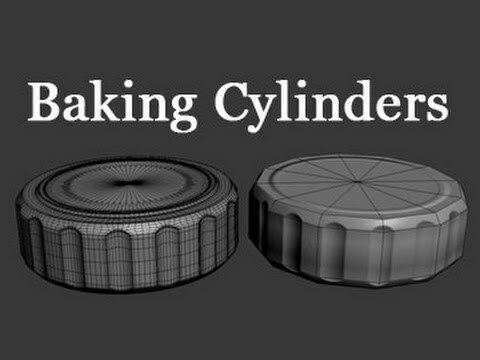 Baking can be used to sort of "transfer" details from one model (like a high poly model) to another (like a low poly model). Or you can bake lighting onto a texture, so that the game engine isn't calculating light during run time. You can bake shadows, or bump maps, or a slew of other things. It's called "baking" because you take all those ingredients and cook them into a final form for presentation. Baking has pros and cons, and (like everything) depends on what you're aiming for. Computational cost now-a-days for a bump mapped texture isn't very high. It does take more memory (you have to store the texture), and it takes some extra amount of time for the video card to sample the texture and do the vector math. But graphics cards are incredibly good at pipeline math, smashing through the same operation on a stream of numbers (like texture calculations for a load of pixels). Here are a couple examples of what a bump map can do (I didn't build these, they're just random google samples). This picture depicts the general flow from high to low poly with a bump map. In #2, the actual geometry is creating the difference in lighting across the face of the cube. In #3, the bump map changes the lighting. And I think this picture is a good depiction because it has the triangles overlaid, so you can kind of see how it's mapped. Looking very cool... nice work! You mentioned baking lighting into a texture. What is the use of that? Would that be for static objects that don't move (in relation to the light), and so the lighting on the object never changes? I could see that being useful for fixed immovable objects and fixed light sources, or for movable objects under a distance light source, such as the sun, where the angle and lighting never changes so long as the object remains out in the open. The square example is interesting. I notice one side of the bump mapped square is in darkness. Is that simply due to the positioning of the square relative to the light source, or is that an artifact of the bump mapping? Could the same bump mapped texture be re-used for all sides of the square? I'm assuming yes. I assume the bump mapping is relative to the normal of the object it's applied to, rather than some absolute normal calculation. The one side in darkness has me wondering if I've missed something though. You mentioned baking lighting into a texture. What is the use of that? Basically what you said...mainly useful for scenes where the lighting doesn't change. That can ease the burden on the CPU/GPU so that you can increase the complexity of the scene or use the extra horsepower on something else. It's not very practical for dynamic objects, except for maybe accent lighting that isn't meant to illuminate anything. 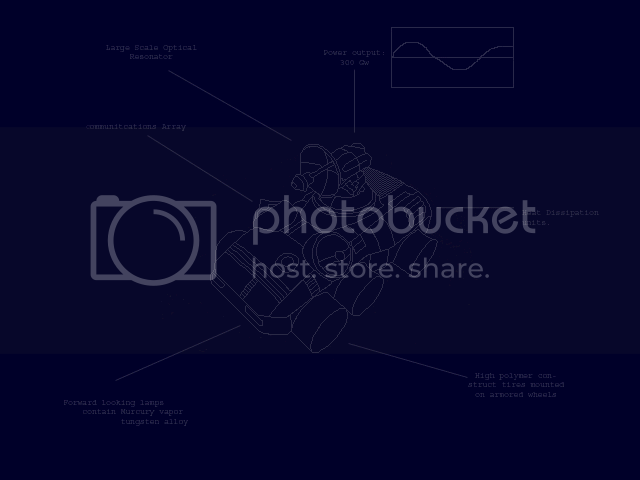 Such as a lit window on a big space ship, glowing off the surrounding hull. Technically the object is dynamic, but the light itself (practically speaking) isn't. There's no need for the computer to constantly calculate that light, so you could bake it into the texture and save the computer the extra real-time work. Also useful for a room scene, where objects aren't really moving around but maybe the player can walk around to investigate or look for clues. >>I notice one side of the bump mapped square is in darkness. Is that simply due to the positioning of the square relative to the light source...? - Yes, my assessment is that the dark side is due to the lighting placement. There are some other small artifacts from bump mapping, but the main "darkness" is simply due to lighting position. If I were to replicate that scene, I probably would use a "sun" light instead of a "point" light to give consistent per-object shading, since the intent is to show the utility of bump mapping. >>Could the same bump mapped texture be re-used for all sides of the square? - Yes, you can reuse the bump map for all the sides...and you could do the same with the color texture. >>I assume the bump mapping is relative to the normal of the object it's applied to, rather than some absolute normal calculation. - You can actually generate bump maps with different reference "spaces." Generally, for 3D game type applications, you use what's called "tangent space," which bases bump map calculations off the normal and tangent of the triangle being mapped. The other main space is called "object space," which would (more or less) lock the bump mapping to a reference based on the object's orientation. Object space is less useful for dynamic 3D games because objects are moving around and rotating, so a fixed object reference doesn't make sense. 3D model polygons have a normal, which is a vector pointing perpendicular out from the face of the triangle/polygon. When shading a triangle, the incident of the light is compared to the normal on the triangle and the line of sight from the camera. That math is used to determine how dark/light to make the triangle. That shading is then applied across the face of the triangle (either in a flat or smooth way depending on how the model is built. However, when using a bump map, the normal of the surface is essentially "angled off" slightly based on the bump map texture, and this is done on a per-pixel basis. So the graphics card can apply a non-flat or non-smooth shading across the triangle(s). This is what gives the illusion that there's more detail than what's actually there. It's trickery with the shadowing, which your brain interprets as changes in the surface features of the object, even though that geometry doesn't actually exist. Your laser and lynx models are looking great! I would go with the top left tire or maybe the middle left tire. Blender is an awesome tool. I think Blender is some of the best open source software available. I've used it for making models to print with 3D printing, but never used the software for animation. It occurred to me if someone was really motivated, they could recreate the in game cutscenes. Since we know how to encode video in the format that Outpost 2 requires to play it would be trivial to change out the videos. Then they wouldn't be 240 pixels wide or whatever they are right now. I'm guessing recreating the models, textures, terrain, and animating everything would be a huge time commitment even for a very short cutscene. It occurred to me if someone was really motivated, they could recreate the in game cutscenes. This has occurred to me as a possible long term goal. I haven't geared myself up for this undertaking, but the thought is in the back of my mind. Sadly, I have no real project or specific goal at the moment...so I've not been very efficient with my time. I just realized, with all the talk of bump maps, I haven't posted any progress. I threw a quick skin on the Lynx model shown earlier in the thread, so that I could check proportions and how things look. I also worked up a fourth version of the Lynx. The nose looks a little long from the front, but I think the side angle looks much more like a military vehicle as compared to the third model version.